I started writing seriously about ten years ago, and I wish like hell I’d had Rachel’s book way back then. If I had I would have avoided years of pain, problems, and lost words. And, I probably would have more published books to my credit instead of just the one I have right now. 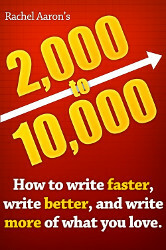 Folks, I don’t care if you’re just starting out as a writer, of you’ve been doing it for years, this book will help you become better, faster, and more thoughtful about your craft. I know that from personal experience. This isn’t some fly-by-night book meant to make a few bucks with a few dusty creative writing cliches. The tips and advice she gives are tried and tested. Not just by her, either. After reading about her methods on her blog, I employed them myself, and they work. It’s also why we brought her on the podcast. Right now I have a new book that is due to be published soon, I have another book that’s in the editing phase, and yet another book that I’m blazing through the first draft of. Rachel’s words of wisdom have helped make all that possible. Do yourself a favor — buy this book. And if you have friends who are writers, do the same for them. Rachel Aaron is a wonderful storyteller and writer, and with this book she’s also helping to make a new generation of writers who will fill the world with many more amazing books.